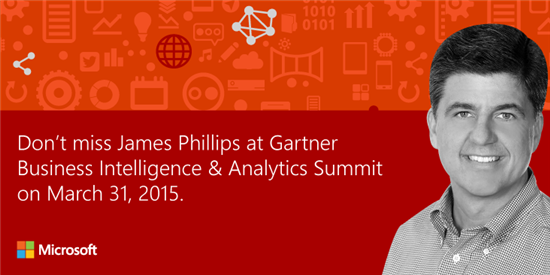 Are you at the Gartner BI and Analytics Summit? So are we! Join us at these various events throughout the Summit, and follow along at @MSPowerBI to hear the latest news from the event. Microsoft Booth #311 in the Expo Hall: Stop by the booth in the expo hall to chat about any BI and analytics questions with members of our engineering team, see the latest demos of Power BI, as well as Microsoft Azure’s big data and IoT capabilities, and of course win some cool swag. Solution Provider Session with James Phillips, Corporate Vice President of Power BI – Tuesday 3/31, 10:45am in Augustus I: You’ll hear about the latest BI offerings from Microsoft and get a chance to see them in action.